This 10 inch Teleprompter kit is quick and easy to connect onto your camera. 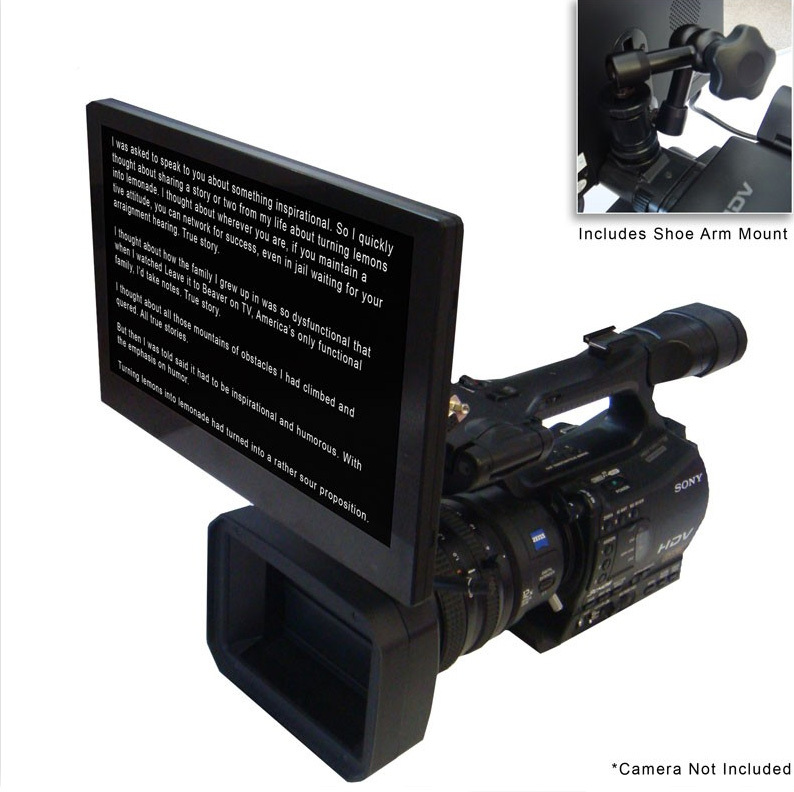 The included 10″ VGA LCD Monitor comes with a 4″ arm & shoe mount that can be mounted on top of any video camera and positioned directly over your lens. You can connect the monitor to any laptop with a VGA video out and run the included prompter software to scroll your script onto the monitor. You can also use the monitor as an external video display that can be mounted on top of a camera or to the side of a tripod, allowing you to step back from the camera while still being able to frame and capture the action without straining to look through the cameras usually small or non-existent viewfinder. Its slim design, low power consumption and low cost make it ideal to use with any digital video camera. The LCD10 can be powered using a wide verity of power adapters, easily switches between 16:9 and 4:3 aspect ratios and has image orientation controls where the picture can be flipped horizontally and vertically when used with Depth of Field (DOF) adapters or as a teleprompter. See our iPad 2 – 3 Teleprompter kit for the -iPad-2 and iPad-3 here.